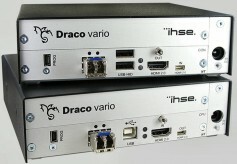 IHSE will showcase its new Draco vario Remote IP-CPU extender module, a first-of-its-kind virtual KVM solution that enables the integration of virtual servers into existing Draco tera KVM physical switch systems. IHSE said the system works in a streamlined multitasking virtual environment where multiple operating systems and applications can be accessed directly from the physical consoles of the Draco KVM system. The IP-CPU extender module is suited to control rooms with virtualized process automation, network operations centers that require real-time access to real and virtual target devices. Users can access virtual machines directly from their own KVM-connected workstations via remote desktop protocol or perform simple PC maintenance remotely. The functionality offers options such as real-time switching, sharing, private mode and flexible, unrestricted access to all connected computers and virtual machines. The 495 Series Draco ultra for HDMI 2.0 enables users to operate CPUs from a remotely located workstation — including DisplayPort monitor, keyboard and pointing device — over a fiber connection. The 495 Series supports the transfer of fully digital video in 4K resolutions up to 4096 x 2160 and 3840 x 2160 at a real 60 hertz refresh rate and full color depth (30 bit, 4:4:4). The KVM extender also supports audio transmission via the HDMI interface. Through optional Draco vario add-on modules, it is possible to integrate digital audio input and output as well as data signals such as USB 2.0 and RS-232. For direct video access in the server room, the CPU includes a local output to connect a control monitor. At the same time, a switchable local input on the CON unit connects to local sources.